When it comes to driving in winter conditions, a common misconception is that all-season tires will deliver the same results as a winter tire. Winter tires drastically vary from all-season tires in both construction, and functionality. All winter tires feature a tread compound that is engineered to remain flexible below 45 degrees. This allows winter tires to retain traction where all-season tires begin to slip. Some winter tire compounds feature small “bite particles” which behave almost like studs, adding extra grip for icy road conditions. Some winter compounds also feature silica-based micro pore compounds, which bite through surface water, adding grip on icy surfaces. Where winter tires are optimized for exceptional winter traction, the compounds that make up all-season tires are designed to perform well in more moderate conditions, particularly when temperatures are warmer. All-season rubber compounds stiffen as temperatures drop. By the time temperatures drop below 45 degrees, all-season tires are hard enough to begin losing traction. This makes braking, accelerating, and cornering less reliable. All-season rubber compounds are optimized for longevity and ride comfort. This is great for spring, summer, and fall driving, but it makes winter driving unreliable at best, and dangerous at worst. Wide circumferential grooves that enhance traction in slush and snow by rapidly expelling buildup from the contact patch of the tire. Smaller shoulder blocks that increase the number of biting edges for grip in snow and ice, without impairing handling or ride comfort. Highly dense sipe patterns that add thousands of extra biting edges. This increases grip in icy conditions. Larger, wider shoulder blocks that are optimized for superior cornering, wear, and all-season traction. They provide less grip in snow and ice. Smoother tread patterns that provide highway comfort and resistance to uneven wear. This makes them less effective at expelling snow and slush from the contact patch. 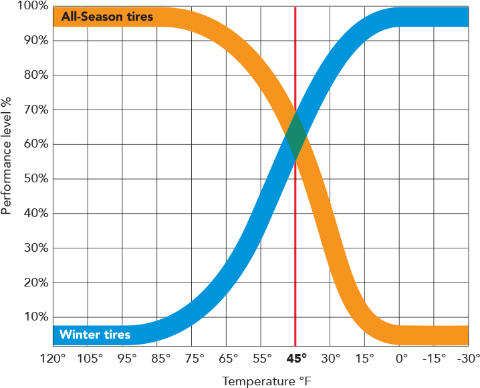 All-season tires have minimal sipes, when compared to winter tires. While all-season tires provide some ice traction, far more sipes are necessary for optimal winter grip. If you want to be certain that your tires are ready for winter driving conditions, check for the Severe Weather Symbol, a snowflake inside a three-peaked mountain. If this logo is on the sidewall of your tires, that means they have been tested and proven under the harshest winter driving conditions. This means your tires meet or exceed standards put in place by the Rubber Manufacturers Association (RMA). If you deal with regular snow and ice, or it is consistently below 45 degrees where you live, winter tires are the safest bet for your vehicle even if conditions are dry. We recommend installing winter tires early to avoid the rush and be safe as soon as possible. Learn more about Winter Tire Changovers. Feel free to check out our Winter Tires FAQs page, or give one of our many store locations a call if you have any additional questions around winter tire safety. We are happy to help out in any way we can.